Steve Jobs announces Apple's new product. Over the past two years, hundreds of thousands of blog posts, forums, and comments had speculated about Apple making a tablet. Last week, Apple did something they hadn’t done during that entire time span. They admitted they had designed a tablet computer. How did they create so much buzz? While I think their new device is a real breakthrough in future computing, I find the marketing (or lack of marketing) for such an item much more fascinating. How does a company build up so much hype? Why are people so excited about something they didn’t even know existed? And why have so many critics turned negative on something that isn’t technically for sale yet? Let’s dive a little deeper to solve the iHype mystery. Develop new things in ways that haven’t been done before. Don’t publicly show prototypes or “proofs of concept”. Make a polished, grand announcement of the new thing. Your business or organization may not make awesome tablet computers, but the principles of iHype can still apply to your business. Whether it is a piece of software, a book, a networking organization, or a physical item, your product or service stands out in some way. You may do lots of R&D for your new device, or you could simply offer a better way to manage alumni donors. Perhaps you offer public speaking advice or maybe you write code and build web apps. You can be a star by developing things that are new, fresh, and useful. Think like Apple and create things that people dream of using. Offer services that no one else can match and create your own category. To build iHype, you must build something to hype up. The biggest lesson here is this: Prototypes eat up all the hype. When you announce that your company is working on a new product to be released in 18 months, users will forget about it two days later. 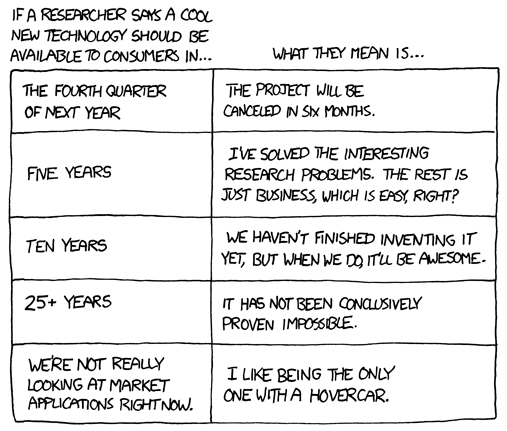 Not only are future predictions unreliable (see XKCD’s take below), you kill off all of your excitement by the time the thing launches. You effectively use your marketing window of opportunity to announce a future announcement. You won’t have the same stage as Apple, but you can deliver your message with the same gusto. If you are issuing a press release, than include graphics, numbers, and memorable quotes and taglines. If you are sending an email newsletter to current clients to announce a new service, give it a great subject line and pay attention to the details. If you are lucky enough to make your announcement in person as a presentation then practice, practice, practice. A boring and unoriginal announcement is likely to be forgotten. Tell the story of your great new thing. The time you spend on it will often mirror the amount of attention it gets from your audience, so put in the time it deserves. Apple made their announcement last week and already many of the tech blogs are denouncing the new device. Apple has experienced the same thing happening with the iPod an iPhone, so they are not fazed by harsh words. You may not have the same experience so a negative review could be very painful initially. Do not let it get you down. Your new offering has taken you time and energy because you built it with intent and passion. If someone with a blog or an email account doesn’t like it, there is no reason they should kill any of your excitement. You are trying to sell your product to people who want it, not people who don’t. Do not forget this. Every product has a negative critic and unfortunately their voices can drown out the positive folks. Have confidence in your service and in your announcement, do great marketing, and the buyers will come. You probably won’t get the same media level of hype that Apple gets, but there is no reason you can’t create stir of similar excitement with your followers and customers. Make something great, boldly announce it when it’s ready, and ignore anyone who talks down about it. These are the simple keys to creating your own storm of iHype. Trend Tuesday: Still Waiting til the Last Minute? In the blogging world, many people teach that having posts on a regular schedule is the way to create a readership. But this is only half of the message. It leaves out the ‘quality’ part. To have a successful blog, there should be a regular stream of quality posts to feed a readership. Here is a quick list on how to have a great blog. Set a regular schedule you can maintain. Repeat 3 and 4 based on 2. Ok, so that probably isn’t the Top 5 list you were hoping to see. Too bad, because that’s really all there is to it. In writing this post I was almost guilty of overlooking Step 3. When you title your blog post Trend Tuesday, you are setting yourself up for a pretty hard deadline. And Tuesday is almost gone. Should I just hit Publish now? Probably not, as I haven’t finished my story yet. So, why am I not done yet? I’ve got some great excuses. I haven’t hit the deadline. For this excuse, I am really blaming the deadline. Unfortunately, deadlines have a tendency to backfire. A week ago we set a deadline to have a new Trend Tuesday blog post done by Tuesday. I had a whole week to get it done. But really, by giving myself a deadline of Tuesday, I committed to doing it on Tuesday. Because this is due in a week, it ranks behind other tasks, until Tuesday that is. Now it is on top of the heap, but it is almost too late. Way to avoid this: set earlier deadlines, or, if you can, do things immediately. Think of the deadline as less of a due date and more of a time to actually do it. And anyways, I work better at the last minute. Because at the last minute, there is added stress and pressure. And I work great under pressure. NOT. At the last minute, I am forced to get things done. Not to make them right, or even above average. And certainly not to make them spectacular. But they do get done. Had I made my deadline, you would have stopped reading after the Top 4 list. That is what is produced by someone who works better at the last minute. Way to avoid this: set standards for quality. For this post, it could be the words, time spent on it, or links. Or it could be that I got 5 other people excited after they read it. But the real reason I didn’t finish on time is that this wasn’t a high priority. Unfortunately, task managers and to-do lists have this annoying priority system built in with 1-5’s and stars and red flags, etc. I think priority is really a boolean, or an on/off switch. Something is a priority, or it isn’t. Merlin Mann agrees, or really, I agree with him. But when I first learned of this task, I said this wasn’t a high priority. But if this isn’t a high priority, then why am I not done yet? It is superseded by a real priority. I made a deadline that was the absolute last minute I needed to finish. I did not make this a priority. I did not start until close the deadline because this wasn’t a priority. I lied to myself about my abilities to do quality work quickly. All of these things caused me to miss the all important Step 3. Fortunately, the place I work is smart enough to recognize that a quality post that is late is much better than a weak post on time. Hopefully the readers if this blog and yours are also flexible. Set deadlines before things are really due, or just do them immediately. Don’t wait til the last minute. Your work is not better when you do. Make quality stuff (which should be on time if you follow the first two). Hopefully the trend of waiting til the last minute will fade like Will Smith’s hair on Fresh Prince. Trend Tuesday: Twittering Top Twitter Trends the new Trend in Twitter? If you are confused by today’s title then you are no doubt just as confused by some of the tweets you may be reading. Two weeks ago a British furniture store was ousted by the Twitter community for abusing the hashtag feature in twitter. They were caught using including terms from the top trends in their tweets when they had nothing to do with the subject. The furniture store has since apologized (and blamed an intern), but the damage has already been done. They may not repeat this act, but unfortunately many folks on twitter will. New forms of Twitter spam pop up daily, and while it is fairly easy to filter out Viagra-hocking followers and ladies of the night, filtering out Twitter’s search feature is more difficult. Now that search is readily available in the sidebar on twitter.com, many users seem to think it fit to include one or many of the trending topics in with their tweets about chilling with their homies. These users are likely suffering from a bit of ignorance with regard to twitter etiquette because they see everyone else doing it. If you happen to be one of these people, you are now in the know that tacking on twitter trends to you tweets is not OK, so quit doing it. Even worse are twitter users who’s tweets consist of listing the current trending topics. Oh how much I would pay for a Ban button to block these buffoons from blasting more bad tweets. The bigger problems with twitter trend spam are the formulaic spammers. For instance, the $2,612 scam is one of the most annoying. The tweets start with a trending topic and even the word ‘trend?’. Then, they are followed by a ridiculous fake new stories like bombs going off in NYC or Egypt, new virus outbreaks killing 3000, or anyone actually buying twitter (none of which are even remotely true). Then the tweet is followed by text along the lines of “earned $2,612 thanks to this to this” with a tiny.cc link to more web spam. This is disgusting and pretty evil at its core and will hopefully be shutdown soon by the twitter gods. As a twitter user and someone who works in the search business, I tend to use twitter search quite a bit. Many of the spammy aspects of twitter can be frustrating, and they force you do make some changes to get the results you are looking for. Here are a few changes I have made. Narrowing the search – on Mondays, #musicmonday is almost always on the top trends. I like to use it to find bands similar to ones I already like, so I search “#musicmonday wilco” to discover related bands. Getting creative – instead of being lazy and clicking the link to the trending topic in the sidebar, I can search for something more specific, like “Roddick 3rd set” instead of “Wimbledon“. Look for Re-tweets – Another trick I use is to add RT or via to my searches. This lets me crowdsource the task of finding the things that real people want to point out. When I find a good nugget of info, I like to re-tweet it as well to spread the news. There is one more action I have learned that has really taught me to use twitter as the service as it was intended: to connect with people. For instance, yesterday the 2009 Personal Democracy Forum (#pdf09) was a very popular subject on twitter, and was trending quite high for most of the day. By clicking on the link to the trend in the sidebar, I was brought to a sea of tweets with great content right next to dirty, dirty spammers. Relying on search alone would have been very difficult in my quest for useful information on a popular subject, so I decided to follow some new people. I added Clay Shirky (@cshirky) and Alex Steed (@alexsteed) to my followers and then I was able to track PDF09 from the comfort of my own home (twitter.com/home that is). And after the Forum, I am free to un-follow them if their other tweets are not something I am interested in. The bottom line is that searching twitter for very popular subjects is a bit broken. The good news, though, is it forces you to be creative and follow new people to gain the valuable information you are seeking. Thanks to this you may discover a new favorite twitter-friend. So, the next time you are searching twitter for trending tweets, look for the good stuff, Re-tweet it, and never tack on trends to a tweet that isn’t about them. Finally, I must add that using hashtags properly is a great asset to twitter, so please DO use them whenever you are joining the conversation. And for those of you that like to tag ridiculous things, that’s perfectly fine too. Trend Tuesdays: Smart Phones just keep getting smarter! All of the big cell phone companies are currently battling it out in the Smart Phone arena and we’re wondering who can get the smartest phone out the quickest (and which of them will actually be smart)…. The Blackberry Tour 9630: This little girl supposedly has all of the best features from the Blackberry Bold, the Curve and the Storm PLUS a ton of other cool new things that will make her better than ever. It’s going to be available later this summer and (as a crackberry gal) I can’t wait! My Touch 3G by Google: supposedly thinner than the G1 and smaller than the Apple iPhone, this little one is anticipated to be the sexiest of the smart phones. The Nokia E75: I’ve already mentioned I’m a blackberry girl, so it’s probably no surprise as the Nokia E75 looks great to me because it’s smart and has a full QWERTY keyboard too. The downside? This little lady is expensive…. topping out at almost $600 (depending on your carrier)! The iPhone 3G S: The iPhone is already everyone’s favorite…. She needs no words. The New Palm Pre: Remember a few years ago when everyone had a Palm Pilot and they were the Queen Bee in the Smart Phone Kingdom? Everyone better watch out because Palm is back and better than ever. Some say the Pre is even better than the iPhone. Which of these little ladies would you want in your corner? Trend Tuesdays: Yes, Dear Non-Profit, Social Media CAN Make You Money! Welcome to the very first installment of Trend Tuesdays, where the Schipulites will bring you weekly trends in the web at-large! To kick off this shindig right, let’s talk about something that doesn’t often get a lot coverage in Internetland: charitable donations. During a recent jaunt to the hilly and chilly city by the bay, I had the honor of attending the NTEN Non-Profit Technology Conference. I learned more than I’d ever imagined about what makes non-profits tick, what makes non-profits boil, and what makes non-profits happy. Of course, there are plenty of things that trip a non-profit’s trigger. Widespread public support, mass exposure for a cause, endless supplies of volunteers, databases full of donors, trays full of cupcakes. Okay, I inferred that last one. But let’s be honest. What do non-profits really want? They want funding, Sherlock! They want donations! They want to have the requisite money to carry out their amazing missions with abandon! One of the discussion points that threaded through almost every presentation or topic at NTC was fundraising, and getting those dolla dolla bills for your non-profit, y’all. Surprised that social media wasn’t the topic du jour? Sure, the social media ticket is trendy in the corporate and marketing worlds, but for non-profits? Social media only cuts the mustard when it can deliver resources. And I came to discover that a key element to using social media as a fundraising tool is Facebook Causes. Now, most all of us are already quite familiar with the viral power of Facebook (and if not, let me assist you in emerging from under that rock where you’ve been living). You can consider the Causes application as the Facebook non-profit niche. Causes is the world’s largest online platform for social and political activism, but with chutzpah. Boasting over 15 million active monthly users (heck yeah, you read that right! ), and 50 million users in total, Causes empowers both organizations and individuals to mobilize their social networks. Every single Facebook user has the tools to create a Cause for an issue or campaign, recruit others to join, spread awareness, and raise money for a non-profit beneficiary. Attract new donors and raise money for specific projects & programs. How does it work? Well, first, a non-profit becomes a Causes partner. By partnering with Causes, non-profits receive official profiles and access to a central dashboard, where they can manage causes, track donations, and download donor contact information. When a non-profit is ready to start its very own Cause, they can get the grab the Facebook Causes application. HALT! There are a few things to note about the Facebook Causes application. First of all, it’s completely, 1,000% free, but it’s only available (right now) to registered 501(c)(3) organizations. This pretty much means that donations can only be processed for Guidestar-listed or Canadian charities. True, any average Joe (or Joanne) can create a Cause via the Causes application, but the recipient must be a registered 501(c)(3) organization. Non-profits get all the good schtuff, don’t they? Another bonus? Since Causes is a third-party application, the non-profit partner is able to have Causes, a Fan Page, and a Group on Facebook, if it so desires. Talk about TRIPLE your fun! The Causes application, however, does MORE than a Fan Page or a Group. The Causes application has the ability to accept donations, it features advanced communication tools that Fan Pages and Groups don’t offer, and it comes bundled with great tools for fundraising, such as setting fundraising goals and matching donations. So how do non-profits make the Facebook Causes application really sing? Title: Make sure the Cause has an action-inducing, attention grabbing title. Cause of Action: Convey a sense of urgency with the cause of action. Make the Case: Make the Cause’s case in three points or less. Background & Objectives: Provide a concise background for where the Cause is currently, and where the Cause is going. Don’t forget to include relevant links! Imagery: Use an evocative photograph that inspires people to take action. Recruit, Recruit, Recruit: Use the recruiting tools associated with the Facebook Causes application to invite the maximum number of potential supporters every day (which is 60), and personalize the ask and the thank you messages you send. But don’t stop there! Take your recruiting outside the Facebook borders to newsletters and email, too! Of course, there are the naysayers of Facebook Causes. In fact, a recent Washington Post article pointed out that fewer than 50 of the 179,000 nonprofits that use Facebook Causes have raised $10,000, and only two (the Nature Conservancy and Students for a Free Tibet) have cracked the $100,000 mark. Yikes, right? We can’t deny that online donations are only 3% of the donations that non-profits receive. But wasn’t it just yesterday that people couldn’t imagine shopping online, watching movies online instead of going to the theatre, or making friends with complete strangers online? What makes us think online donations to charitable causes are any different? If we’re looking at past trends, then they’re not any different at all. Facebook Causes is a great step in the right direction for learning how to better meet the needs of non-profits. A non-profit’s priority is fundraising, right? Then we go to them, young Padawans, and we show them the way.